The (sort of) Great 400mm Lens Shootout! Some old picture or me carrying lenses, because the editor counts pictures in the articles but doesn't read the captions. I get asked a lot about different telephoto lenses. Is the 400 DO II better than the 400 DO? Which is better, the Tamron 150-600mm or the Sigma 150-600mm? You’ve probably noticed that I don’t answer those questions. The reason is simple. 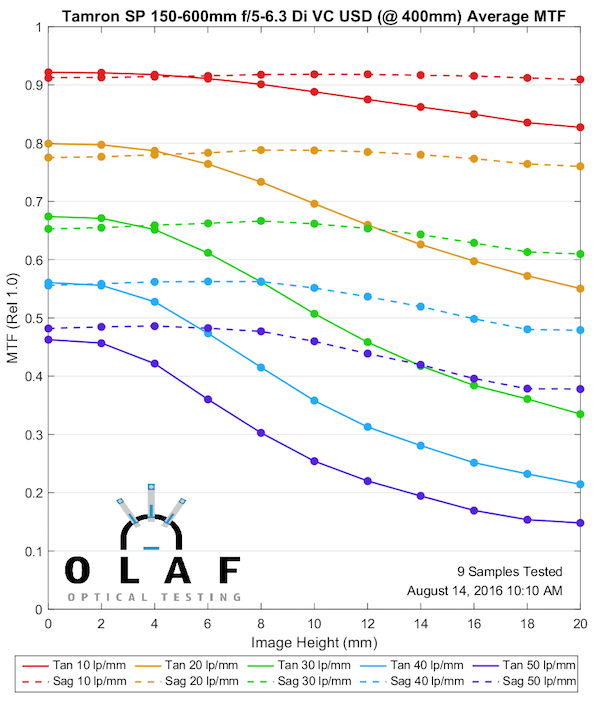 Our optical bench is designed to test lenses up to 2.5kg weight and a maximum of 250mm focal length. Most super telephotos fall outside that range. 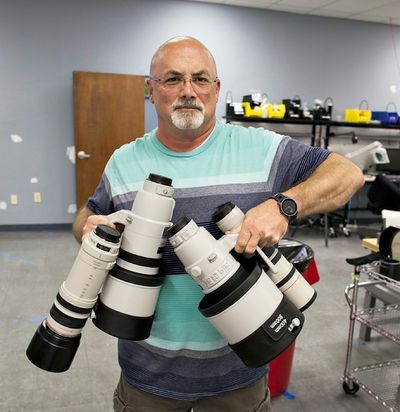 Some old picture of me carrying lenses, because the editor counts pictures in the articles but doesn’t read the captions. I know it’s an old picture because if we had an area with that much empty space Tyler would have put 6 workstations in there. Note From Editor: I read the captions. But, of course, we’ve spent most of the last 10 years figuring out how to do things we aren’t really supposed to be able to do. 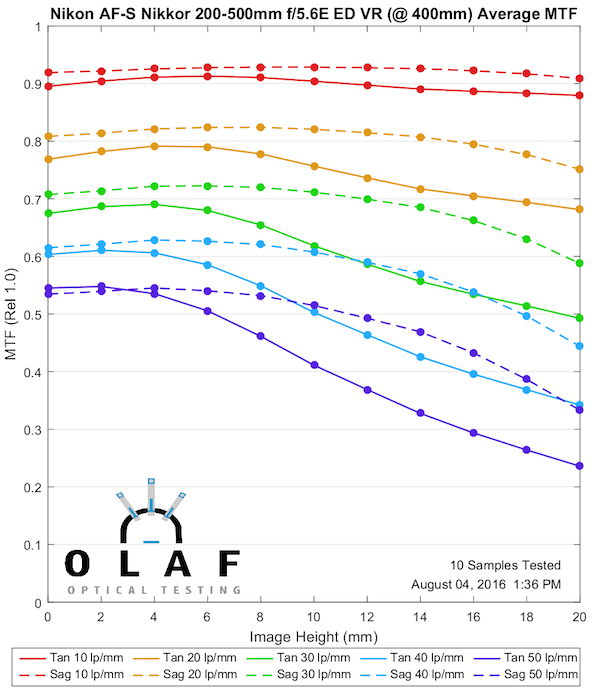 The truth is, with some reprogramming (like overwriting the expected focal length in the software), really careful technique (like a long delay for vibration dampening between each measurement after the machine moves), and a few other manipulations, we’ve found we can test most lenses at 400mm with good reproducibility. Notice I said most. One lens you’ll see missing today is the Nikon 400mm f/2.8 VR II. Now I do expect that Nikon fans will claim a major conspiracy, but the truth is simpler: the first 400mm f/2.8 VR II is the heaviest super telephoto we tried. When we did, I thought there might be a bit of vibration-induced variance in the results so I don’t think they’re valid and don’t want to post them. I do solemnly swear that I understand the following. The reason 400mm was chosen is because it seemed like a nice round number, and there are lots of lenses that get there. A given lens’ results at 400mm aren’t necessarily similar to those at 300 or 600mm. 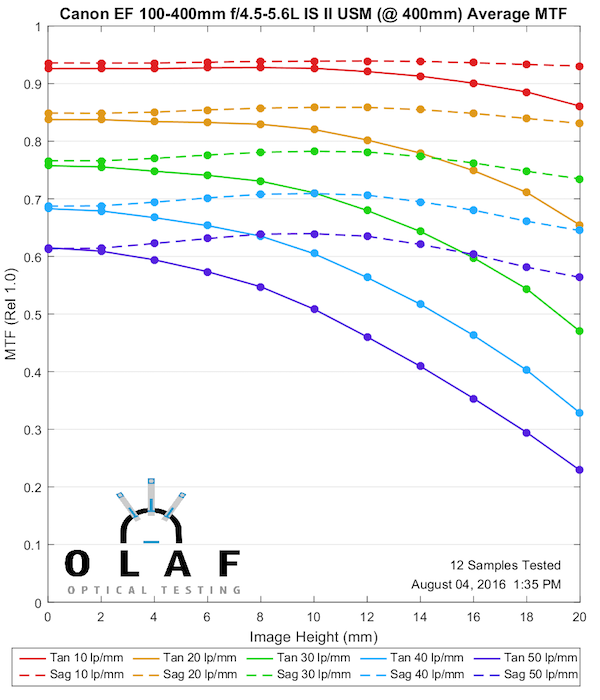 These tests were performed on a machine that isn’t designed to handle these lenses, and therefore may, or may not, be all that damn accurate. 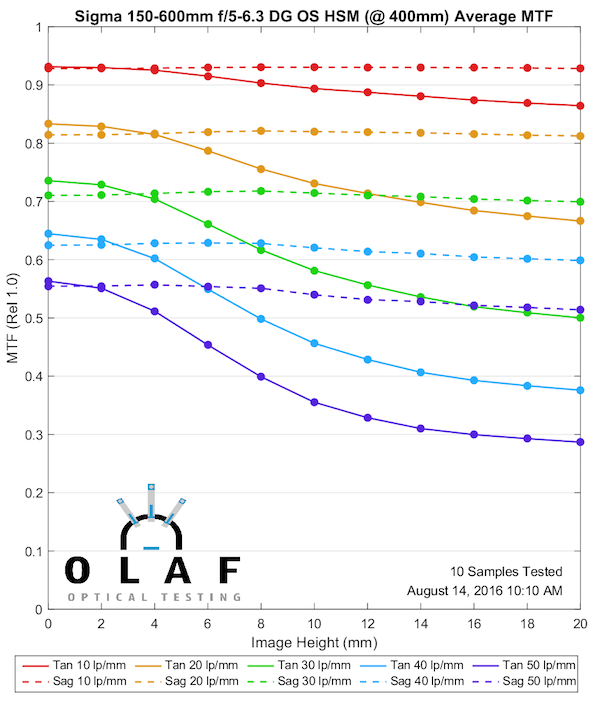 The MTF graphs are the average of multiple copies, but for many of the lenses, we used 5 copies instead of 10. These were time-consuming. 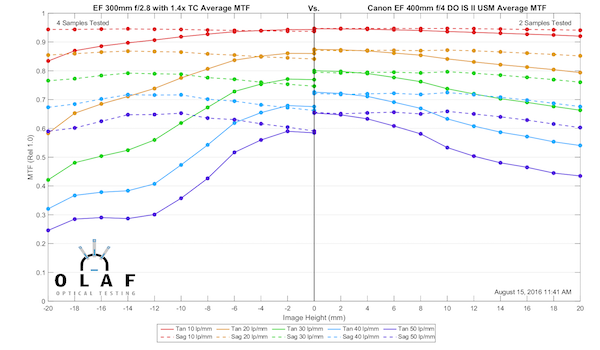 A lens tested at f/2.8 should have lower MTF than one tested at f/4, etc. So don’t say something stupid about a f/5.6 lens being as good as a f/2.8 lens. Also, I promise not to ask Roger to repeat the tests at f/8, or 600mm, etc. because I realize the bank’s going to come take his machines away if he doesn’t start doing some stuff that generates revenue soon. 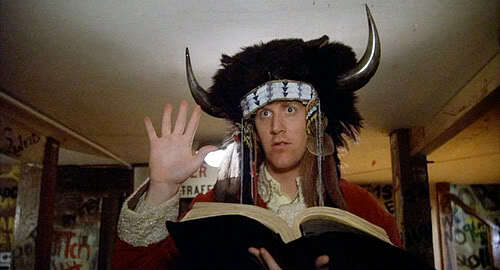 Very good, you are now members of the Delta Tau Chi optical testing fraternity. You may now read on. This is the section for both of you who want the absolute best lens at 400mm, and money is not (or at least not much) of an object. 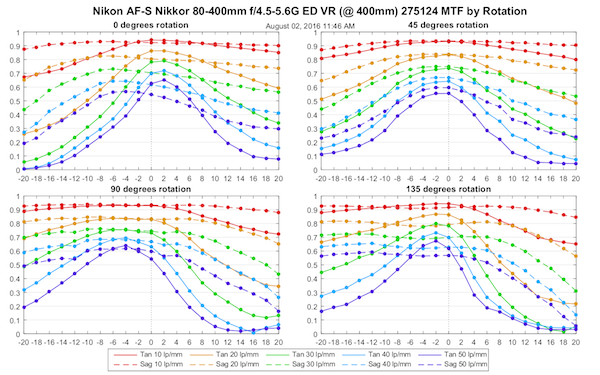 If you’re a Nikon shooter, just pretend the Canon 400 f/2.8 MTF curve says “Nikon 400mm f/2.8 VR”, and then skip on down. The 400mm f/2.8 lenses are pretty identical. This is optically the best telephoto there is, and all other lenses are measured by how close they can come to this one. It should be the best, it’s very big and breathtakingly expensive. A lot of Canon shooters want to know how close they can get if they give up a stop of aperture and get the markedly less expensive and amazingly lighter 400mm DO II. The answer is at f/4, the 400mm DO IS II is basically as good, at least in the center 1/2 of the image where most telephoto subjects rest, as the 400mm f/2.8 IS II is at f/2.8. Let me emphasize that this is the DO II. The original isn’t quite as good as you can see below (The DO II is on the right). And while we’re answering questions Canon telephoto shooters ask all the time, let’s compare the 400mm DO IS II to the Canon 300mm f/2.8 IS II with a 1.4x Mk III teleconverter since these are both f/4, of similar size, and similar cost. The 300mm + 1.4X combination, is, of course, 420mm so it is a bit longer range. As you can see, the 400mm DO IS II is a little bit sharper than the Canon 300mm f/2.8L IS II with TC combination on the bench. In the real world, though, the 300mm with TC combination offers some other advantages (like being able to be a 300mm f/2.8 when you want) that may be more important than the MTF curves. As an aside, we experimented a fair amount with the 300mm f/2.8 and 1.4x combos. First using the same lens with different converters, then using the same converter with different lenses. The converters don’t vary as much as the lenses, which makes sense; they’re optically much simpler than the 300 f/2.8 lenses. OK, the vast majority of us aren’t interested in a $10,000 lens that requires a heavy duty tripod to use effectively. That is a specialist’s tool. We are more interested in that zoom or prime lens that can get us to 400mm at a fairly reasonable price. I understand you’re also interested these days in the third-party lenses that do that and we’ll get to those next. But it’s important to look at your brand’s offerings first, so you have that comparison point. (Spoiler alert: If you shoot Canon you’ll probably love the 100-400 IS II; if you shoot Nikon you probably won’t love the 80-400 VR II). The Canon 100-400mm f/4.5-5.6 IS II is generally considered one of the best telezooms on the market and it’s MTF curves tend to support that idea. Remember, though, with the zooms we’re looking at them at f/5.6 at 400mm. That’s two full stops less aperture than the 400mm f/2.8 we started with. But the Canon is excellent at 400mm as you can see. And just because I wanted to know, we tested the old, but excellent Canon 400mm f/5.6 L prime lens, for comparison. Few people shoot it anymore, but there’s a reason it’s remained in production for decades. It’s not quite as good as the 100-400 IS L, but still, an excellent performer considering how old the design is. (In the lab. In the field I’ll take the IS every time). Commonly called the 80-400 VR II, this lens has been the Nikon 400mm zoom for some time now. It’s, well, it’s better up to about 300mm, but it’s just not that good when you stretch it out to 400mm. Not a great performance for a lens that demands a premium price. The newer Nikon telezoom is something of a different beast. It’s a fixed aperture lens and it zooms out to 500mm, so it’s the first lens in this test that can actually go past 400mm. Plus it’s a lot less expensive than the older 80-400mm. I can’t comment on how it performs in the field, but from an MTF standpoint, it outperforms its much more expensive brother at 400mm. These recent entries in the super telephoto zoom market have changed things quite a bit. The Sigma Contemporary and Tamron lenses both can be had for under $1,000; much cheaper than the brand-name zooms. 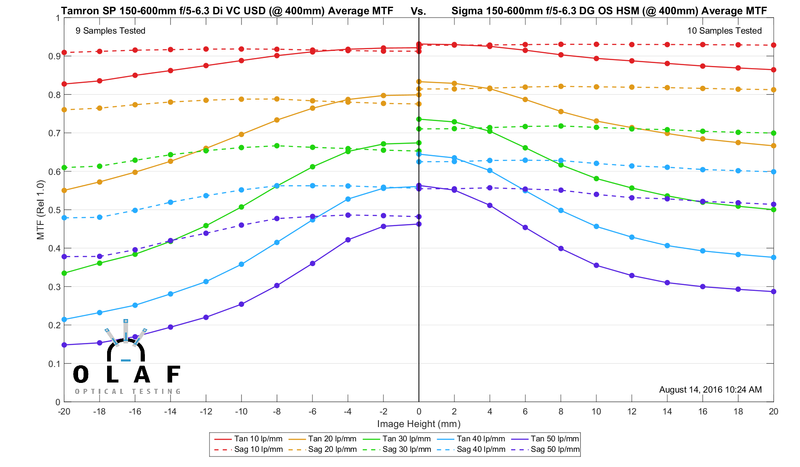 The Sigma Sport is a different lens, being almost 50% heavier and about twice the price of the other two. 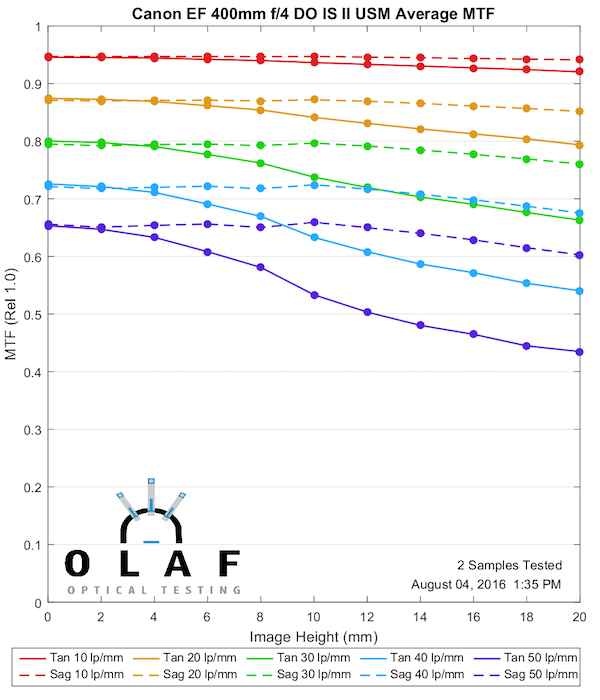 There is one HUGE, IMPORTANT thing I want you to take away from the MTF curves on these lenses. At 400mm the two Sigma lenses are at f/6.3 maximum aperture, the Tamron is at f/5.6. Now I don’t think that half stop is going to affect your shooting significantly, but it probably will have some effect on MTF curves. The Tamron, Canon, and Nikon zooms we tested above are all done at f/5.6 and should each be at least a little better MTF stopped down. And yes, I know you wish I’d tested them all at f/6.3 to even the playing field. But I’ve got paying customers waiting and bills to pay. Just in case you missed it, the Tamron testing aperture is f/5.6 at 400mm, so we can directly compare it to the Canon and Nikon telezooms above. If you make that comparison, you’ll see why, for quite a while now, I’ve recommended this lens to Nikon shooters instead of the Nikon 80-400mm VR II; its similar in sharpness, far less expensive, and has additional range. But at the same time, I’ve told Canon shooters if they want the sharpest zoom at 400mm, to stick with the Canon 100-400. Obviously, if they want 600mm range, then my suggestions are quite different. The Sigma Contemporary is very similar to the Tamron in size, price, and obviously, range. You can probably tell the Sigma has a slightly better MTF, but I’ll put them side-by-side below for easier comparison. I suspect that even if we stopped the Tamron down to f/6.3 the Sigma would be slightly better in the lab, but I also doubt the difference is nearly as great as the copy-to-copy variation. In other words, I wouldn’t consider MTF to be a significant factor when deciding between these two lenses. Things like how it handles, focuses, and how well the stabilization works are going to be way more important. As I’ve mentioned, despite the similar names this is a very different lens than the Sigma Contemporary. One of those differences is weight and size. It’s the second heaviest lens we tested; only the Canon 400mm f/2.8 weighs more. But the Sigma Sport differs in that a lot of its weight is in a very heavy front element that sits at the end of an extending zoom barrel, which for purposes of testing at 400mm is partially extended. 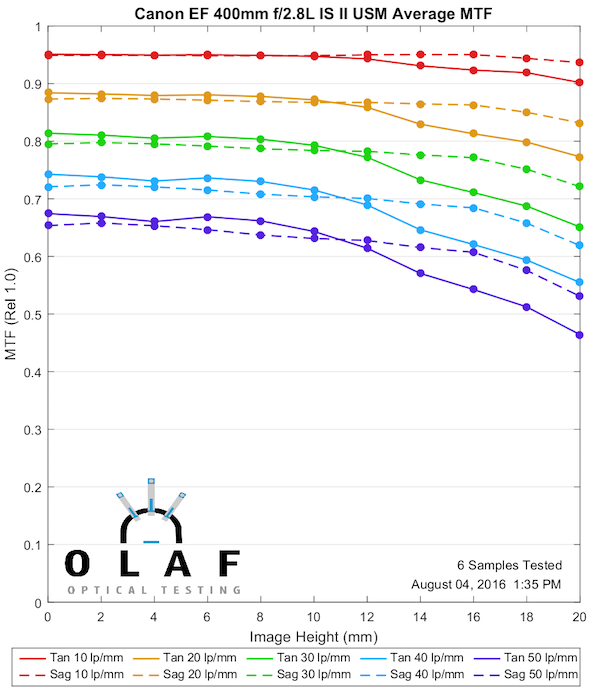 When we tested it, slight vibrations interfered with testing enough that we had several bad readings for each lens. For that reason, much as I wanted to compare the Sigma Sport to the Sigma Contemporary, I just don’t have enough faith in the results to make them public. I don’t think we really did too much here today except to have some fun and confirm, in numbers, what most people already know. The 400mm f/2.8 lenses, if you can afford one and don’t mind carrying it, are amazing. Canon’s new 400mm f/4 DO IS II is also superb, at least as good as the 300mm f/2.8 IS II with a teleconverter. Canon’s 100-400 IS II is, from an MTF standpoint, the best zoom at 400mm, but the Nikon 200-500 and both the Sigma and Tamron 150-600s are also really good, far less expensive, and have greater range. The Nikon 80-400 VR II is not quite as good at 400 as the competition. Geek Note: Some of you may have noticed the two Nikon lenses seem to have astigmatism right in the center, which is, to say the least, unusual. This is one of the things that has more to do with our testing than reality. Remember we test the lenses rotating them so we take 4 slices to get a complete picture of the lens. With these heavy, extending barrel zooms, the barrel tilts a bit with extending, so the center doesn’t quite stay in the center, it’s a few mm off center in some rotations. Here’s a random 80-400 as an example, showing you all 4 quadrants of MTF. You can see that the best center is the 45-degree rotation, but at other rotations, the best reading is slightly off-center. 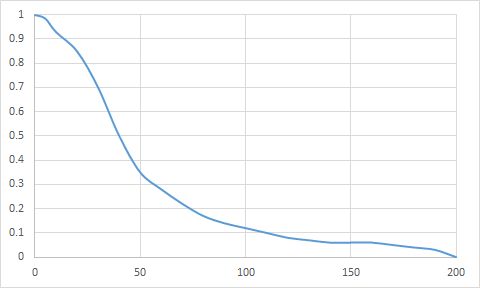 We can have a geek argument that maybe we should recenter at each rotation; it would make prettier MTF curves. My thought was nope because the whole purpose of the 4 rotations is to look at the different areas of the lens at the same position, just like it would be in an image. Besides, this is the way we’ve always done it. But let me add that that is NOT the way the manufacturers would do it. They show you a single cut, so, in this case, our 45-degree cut should be closest to the manufacturer’s ideal. That’s heavily dependent upon how a particular camera handles different ISO settings. Not all cameras are anywhere near equal in this respect. Some camera’s signal-to-noise ratio is a fairly uniform inverse stair step progression from lower to higher ISo settings. Other cameras only really change the analog signal amplification in whole-stop ISO steps. the +1/3 and -1/3 settings are pulled when shot/pushed when developed and pushed/pulled respectively. This makes ISO 160, 320, 640, etc. the equivalent of ETTR 1/3 stop and, more importantly, makes ISO 125, 250, 500, 1000, etc. the equivalent of ETTL 1/3 stop. With such cameras, ISO 640 can have better SNR than ISO 125 and ISO 1250 is almost the same as ISO 125 under the same lighting! Thanks Roger for this test. I’ve chosen the 400DOII i.o. the 300 2.8 because for birds 400mm is not that long, and 400+1.4 should be better than 300+2.0, certainly for AF and most probably also for image quality. The 400DOII is indeed very good also with a 1.4 extender, on a crop you need some luck with the 2.0. I am very satisfied since it is also very light. I also keep my 400 5.6, it can be very sharp as you measured. The 100-400 II is a lot heavier, I seldom need a zoom and will keep my old 100-400. Imatest would call this 40*24 = MTF50 of 960. If the imatest score became 984, then it would be equal to 41lp/mm. If it was 2400 it would be 100lp/mm. If it was 1200 it would be 50lp/mm. They have flipped the x and y axes of the plot. It makes MTF50 very difficult to make use of. Giving it as a function of field/image height particularly is a very bad idea. 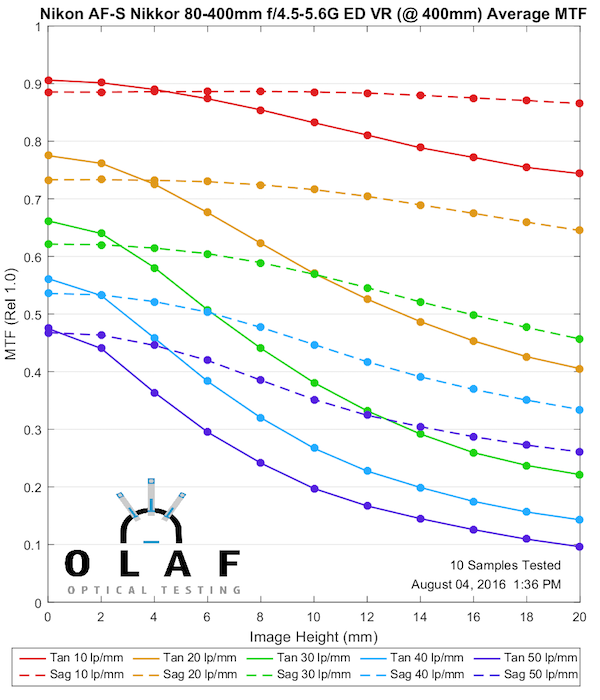 Alan, that’s roughly correct – although Imatest values don’t separate tangential and sagittal data – and of course Imatest is reporting the summary MTF of lens and camera, where the bench is evaluating just lens. In that case, would the Imatest correspond to the interpolated/extrapolated values of lp/mm where your values give 0.5? They don’t. Imatest typically reports MTF50, which is the frequency at which the MTF reaches 50%. Then they multiply by the height of the image in mm. So a score of e.g. 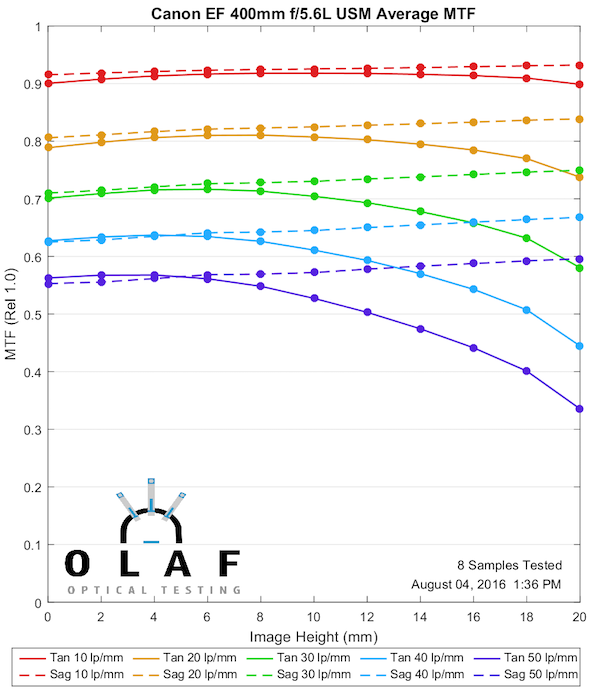 850 MTF50-H on a 24x36mm sensor means the MTF reached 50% at 850/24 = 35lp/mm. Like many, my wallet isn’t stretchy enough to go for a 500F4 mainly due to having 2 teenage daughters. So I have to use a 100-44 MK2 for all my wildlife fun. For me noise is rarely a problem, I would rather get the shot and clean up the noise rather than have a blurry image. Shooting at high ISO, even at 8000 a good shot can still be had but it does all depend on the shot and the exposure etc. Some shots can look horrible with high noise, others will look great after a little selective noise reduction. Those that look terrible due to noise would often be poor shots anyway so would go in the bit bucket. I can honestly say that with more modern bodies 1/3rd of a stop has never bothered me from a noise point of view. By selective noise reduction what works for me is applying lots of reduction to the out of focus areas and almost none to the details where noise doesn’t show much anyway. Others may look at my images and hate the way I do my PP, but as long as those images make me smile who cares. Shooting at 1/2000, f/5.6 in less than great light, ISO can quickly increase to a level where it’s at the threshold of what’s acceptable from a noise standpoint. Giving up even a third of a stop in image brightness and having to compensate by increasing ISO can push noise over the threshold. So, while a 1/3-stop may not be significant on paper, it can be significant in real world use. A third of a stop can take an image that would have been (just) acceptably clean and transform it to an image that is too noisy to pass muster. This is a lesson that’s been driven home time and again over the last 9-10 months shooting with the 200-500. At f/5.6, it’s right at the threshold of what I consider acceptable for BIF or other fast action photography. Giving up another third of a stop in image brightness just isn’t worth (to me) any degree of improved image sharpness, AF quickness or accuracy. As much as I enjoy shooting with the 200-500, I have to admit it’s given me a taste for the idea of working with a 500, f/4 or 400, f/2.8. That said, my wallet still has a taste for the 200-500 ? I would agree with Ritvar, 1/3 stop is not significant with regards to noise on most camera bodies. What does make a difference however is focus speed. The Sigma at f6.3 is noticeably slower to focus on many camera bodies and for BIF that certainly does make a difference. Coupled with the weight the Sigma just does not compare to the 100-400, 400mm f5.6 or the 100-500 Nikon out in the field. OT? I grapple with whether use of a good-to-very-good Canon EF 100-400 (1st or 2nd Gen) would be a net gain compared to my excellent EF 70-200mm f/2.8L IS ii on a high-res camera like the 5DS[r] or adapted to my Sony a7Rii with “Super Exmor” sensor. I take a lot of images from a balcony / crow’s nest where the stage is far enough away that quite a bit of cropping is required to get a “waist to head” capture of a soloist or duet at 200mm. A 400mm focal length that was as sharp as the 70-200mm at 200mm would be advantageous … at least for Big Prints. But with the 100-400mm zooms, I’d lose 2 stops from f/2.8 to f/5.6, so the shutter speed would be much slower. So … my speculation is that significantly cropped images from my 70-200mm adapted to my a7rii nets out to be “good enough” and Much More Flexible than a 100-400mm with adapter. Mostly true for prints up to letter size 8.5×11″? 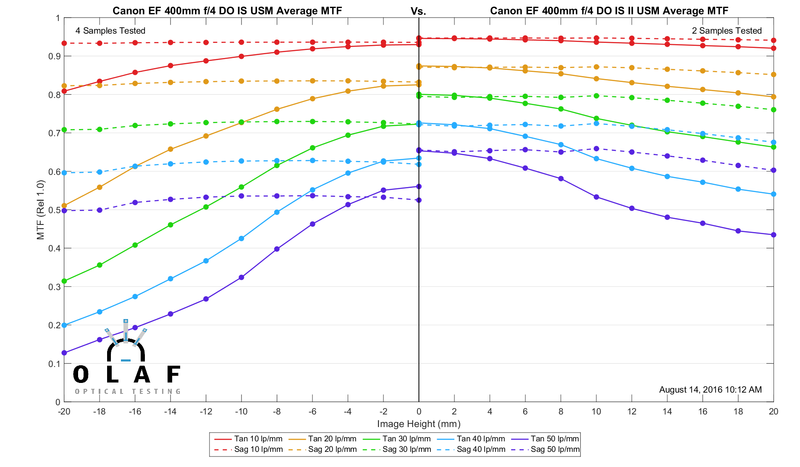 Or “confirmation bias” to counter “lens lust” for a refurb 100-400 2nd gen or … dream on … an EF 400mm f/2.8 IS (1st or 2nd gen)? I’m very disappointed that the optical testing facility is called Delta Tau Chi instead of Mu Tau Phi (from MTF). Apart from that… thanks a lot, this was super useful!!! I rented the EF 100-400mm f4.5-5.6L I in 2014 and the II in 2015. I never got to use the Mk I for its intended purpose since Augusta National closed the practice round due to severe storms. The Mk II performed great for The Masters practice round in 2015. I would buy this lens, but for some college venues, they restrict the length of the lens to 6 inches. Michael, the setting on the lens may be a bit different, and the actual range is usually 5% or so less than listed. So the 100-400 and 80-400s are really about 390mm or so. The old Sigma 50-500 was the biggest difference I remember, being about 470mm actual. Roger, do you have any thoughts about on whether 400 with one manufacturer may not be the same as another. Also these lenses are usually used at infinity distance and I have noticed many of my long lenses are great in close but suffer if stretched to infinity. I am a Sony shooter and have to ask where was the 70/400? Keep up the good work, you are a treasure for the photographic community. Roger, your testing is something to be proud of, the honesty in pointing out potential test shortcomings while sharing the data is a great example to others on how this should be done. I always enjoy reading your tests, thanks very much for the time and effort it takes to do this. Not only is it interesting, it’s quite an education for most of us who will never have an opportunity to try a lot of this stuff. You help us make informed choices, and I really appreciate it! Brad Hill loves his Sport 150-600 and I’m excited to try it. He’s used to his super-tele-primes so the size of the Sport doesn’t bother him, but I’m curious if it’ll bother me! I already have a reservation in place for it in November. I have some shots I’m proud of with my Tamron, but I always want the DxO post-processing help to make them better. Particularly when you know your results will be misconstrued, idiosyncrasies not withstanding! Remember the key to all of Roger’s work – YOUR single copy of the 200-500 is worse than YOUR single copy of the 150-600. I’m glad you were able to figure out which was better!